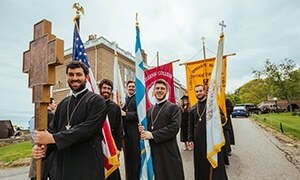 Support the only Orthodox Christian college, graduate school of theology, and seminary in the Western Hemisphere by becoming a Guardian of Hellenic College Holy Cross. On the altar in our Holy Cross Chapel stands a large silver cross which holds a precious piece of the very Cross on which Our Lord Jesus Christ was crucified. It is brought out in solemn procession twice a year: on the school’s feast day, September 14, the Universal Exaltation of the Holy Cross, and again on the third Sunday of Great Lent, the Veneration of the Holy Cross. For many years, this special relic has inspired faithful men and women on the Holy Hill of Hellenic College Holy Cross as they prepare for lives of service in Christ’s name. Now, it also inspires the creation of a new category of giving in support of our school’s sacred mission: the Guardians of Hellenic College Holy Cross. Orthodox Christians committed to protecting the future of our Faith for their children and grandchildren. What is the Guardians’ purpose? To ensure that HCHC–the only Orthodox Christian college, school of theology, and seminary in the Western Hemisphere–will continue to educate the servant-leaders of the Church and society for generations to come. What does it take to become a Guardian? We ask that each Guardian make a gift of at least $1,000 per year in support of our school. How will we acknowledge the role of the Guardians? We will offer prayers for the Guardians and their families at every Divine Liturgy and Paraklesis in Holy Cross Chapel. A record of each Guardian’s dedication and prayer request will be kept in a special book. Once a year, the Guardians will be invited to our campus for a full-day retreat with members of the administration, faculty, and staff. Other benefits are being discussed and will be shared soon. Please read this message from the President for the story behind the Guardians. You may also download this bulletin insert to share with your parish on the Sunday of the Veneration of the Holy Cross. Donors as of 4.18.19. Please check back weekly for updates.